The infectiousness of laughter even works across species. 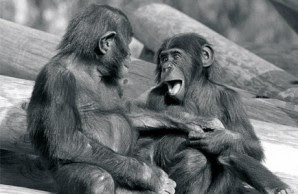 Below my office window at the Yerkes Primate Center in Atlanta, Georgia, I often hear my chimps laugh during rough-and-tumble games, and cannot suppress a chuckle myself. It’s such a happy sound. Tickling and wrestling are the typical laugh triggers for apes, and probably the original ones for humans. The fact that tickling oneself is notoriously ineffective attests to its social significance. And when young apes put on their “play face” (as the laugh expression is known), their friends join in with the same expression as rapidly and easily as humans do with laughter.